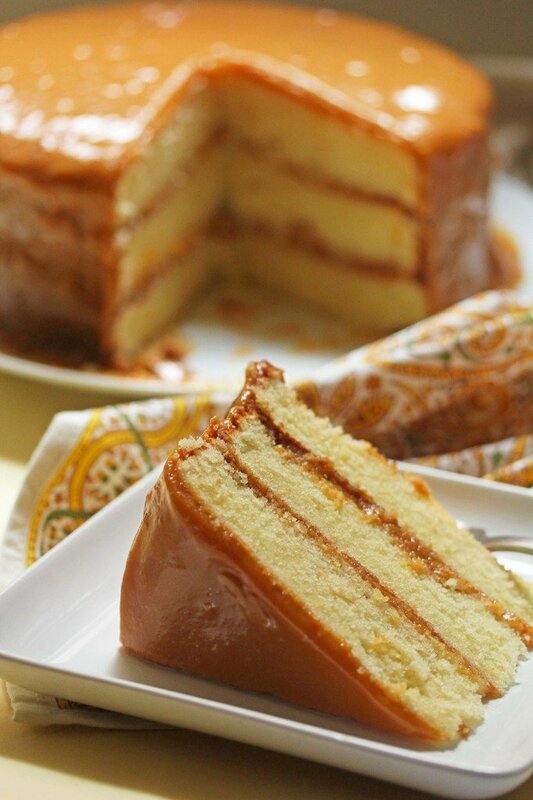 This is my kind of caramel cake. Looks really good. Wow, talk about a show stopping dessert! This is a MUST make and enjoy! What a dreamy, irresistible cake!! I can never say no to anything caramel!!! Hi Jocelyn, I want to make this for Thanksgiving and want to make ahead of time. How do I store it? Can I refrigerate without the frosting getting hard? Or could I make the components and then frost day of? Will the frosting soften up to a spreadable frosting if I let it sit out after refrigerating? Thank you! Yes you can make the frosting ahead of time and then bring it back to room temp. Also if you want to make the cake layers ahead, you can wrap them super tight in plastic wrap and freeze them and then thaw them ahead when you want to frost the cake. 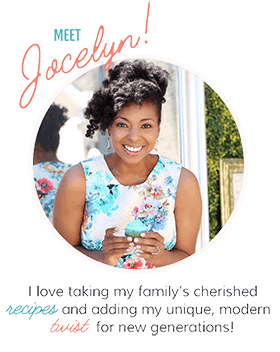 Hi Jocelyn, I want to make for Thanksgiving. So, if I make this Wednesday, how would I store it? Will it refrigerate ok? Will the frosting harden? Appreciate your help. Thanks. should the 11/2 stick of butter in the icing be unsalted? Honestly any butter you have on hand will work perfectly. Finished. It took me 3 hrs to boil the caramel down to thickness but that’s my fault for not having a deeper pot. I had to keep taking it off the burner so it wouldn’t boil over. Taste good. Thanks for your recipe. The caramel still ooze off the cake tho even after cooled. Hooray I am so so glad you enjoyed it! This cake…perfection! Not overly sweet, perfect crumb and just the right amount of icing. I’m in love ? For some reason I cannot leave 5 stars but it had definitely earned it ????? This cake is every bit as good as stated. At the 35-40 minute mark, my frosting was thick and fully coating the spoon. I added milk to thin it out, as suggested, and it turned out very nicely. The cake is buttery, rich and moist. Great job, Jocelyn!! Thank you for sharing. Wonderful! I’m so so glad you enjoyed it. Thank you for the review. I have made this cake twice over a few years following your recipe. I still get people bringing up how they snuck back into the last party after leaving, to get another slice of this cake. haha. You’re awesome. Awwww I’m so so glad!!!! Thank you so so much for sharing all of your tips and wonderful advice!!! I think it is so helpful. I’m so glad you enjoyed it. This cake is perfect. 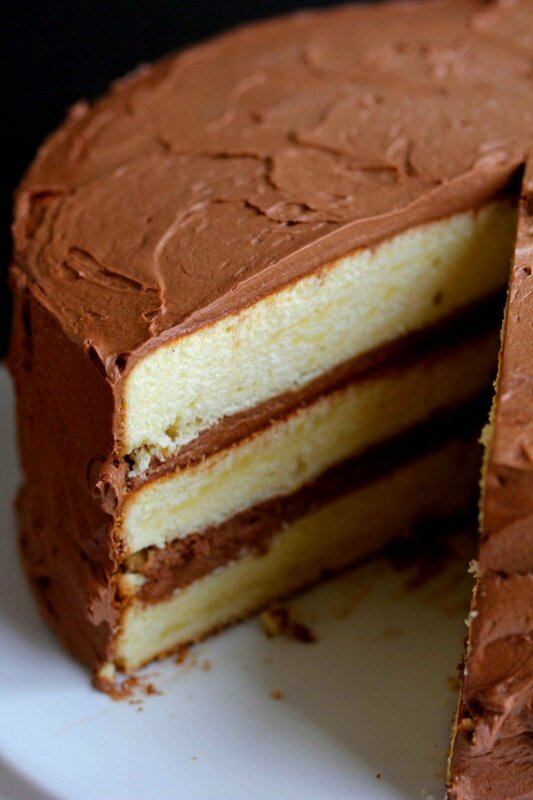 Real deal Southern layer cake you would find at a potluck. I use a white enamel cast iron pot for the icing. 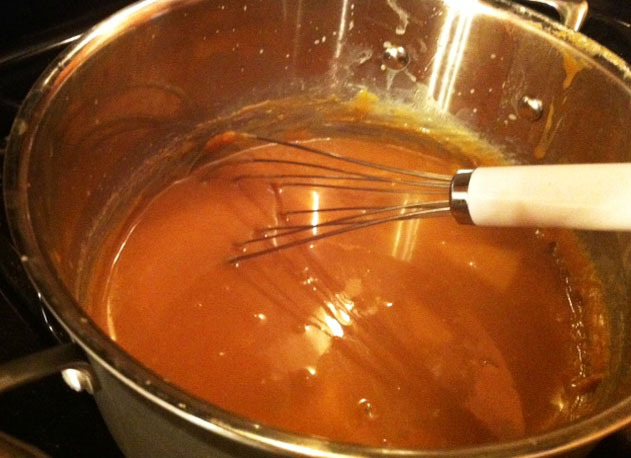 It only takes an hour, stirring frequently, to get it thickened and caramel color still only on med-low. I don’t know if it’s the pot but it also helps that you can see the caramel color in a white lined pot. Make this cake. Aww thank you for the sweet comment! Hi Star, are you stirring the caramel? Also I have more detailed instructions for this caramel in my cookbook if you want more step by step. Hi, your cake is wonderful !! I would really like to cook it, but I have small difficulties, since I live in another country. Please write, if you are not complicated, how many each product is required in grams. I read all the comments and did not see people who would be interested. Thank you. Just made this today.. YUM!!! 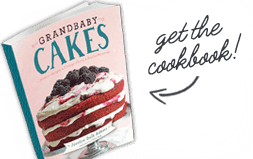 I don’t know how to post a pic or I would..
Hooray you can email me one or you can add one to social media with the hashtag #grandbabycakes! So I cooked the caramel for 2.5hrs then cooled it for 45 mins. I put it in the freezer for 10 mins after to see if that would help. Nope. It never really thickened to be like caramel made using the candy + cream method but sure, it coated the back of a spoon. The finished caramel ran liquidy all over the cake and soaked the layers leaving them sort of filling-less. Not sure why this method yields a better caramel but I’m glad others are happy with it. Just feedback for those wondering what was happening for them. I followed the recipe exactly, using all ingredients as stated. Thank you for the recipe. Hi Ono, I would love to see a photo of your caramel. That’s so strange. We recently did a video at the top that shows you what the caramel should look like. I made your caramel cake over the weekend. I must say my cake turned out soooooo good. I shared it with my friends and family. My mother is old school so when she told me that my cake was good I knew I found a great recipe. Thanks for sharing this recipe. This is it! I have been trying to find the recipe that my grandmother used to make her caramel pecan cakes. She was born in Arlington, GA, but earned her living as a maid in Miami, Florida. I was not sure if it was a recipe that she picked up in Georgia or one she learned as a maid. 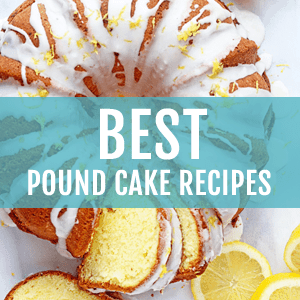 When I saw the recipe, the cake and read the comments (many the same as my family would make after eating a slice or two), I knew it was the one or very similar – without the pecans. I will be using this recipe to make the cake this weekend. I am sure it will be exactly the same. 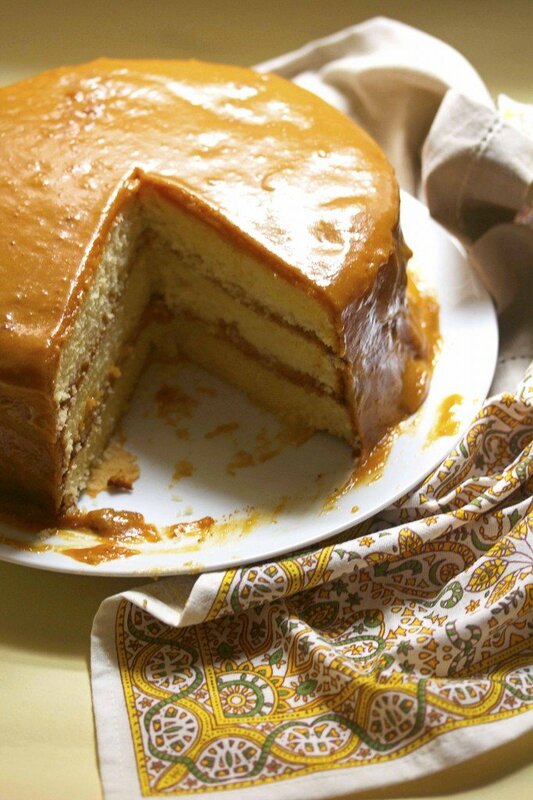 if it is, I will share it with my family members- all of whom miss my grandmother’s caramel cake. Made this cake last night and sliced into it this morning. It was so good! I will make it again and again. Moist beyond belief and the caramel was on point. My grandma use to make caramel cake all the time but it was dry so I set out to make a better cake and your recipe is my new favorite. Hooray! I’m so so glad to read this! Thank you for sharing with me. Just made this cake yesterday. Amazing!!!! First cake made from scratch. Is there a certain brand of cake pans you recommend? And Must it be completely cooled before removing the cake? I had an issue with the final look and sticking issues. Thanks so much for the super sweet message. I use Kitchenaid pans and they work super well. My mother asked me to make a caramel cake with the yellow cake? I’ve never heard it put that way but I’m assuming this cake is a yellow cake? I’m nervous because I’ve NEVER cooked for my mother. I’m pushing 50 and left home at 19. I go home to visit but that’s it. I’m looking forward to making this for her. Thank you for posting it. Oh you can do it! I know it will be so fantastic. Just bake with love and it will all turn out fine. My grandmama use to make a cake like this all the time. Happiest childhood memories! I totally know the feeling! Oh, Jocelyn. This cake almost makes me weepy. I want! Took me forever to make but was sooooo worth it! The caramel simmered/bubbled away for 1 1/2 hours and coated the back of a spoon but didn’t thicken enough, it poured over the cake and made an awful mess! Still tasted amazing though, put the cake and the leftover caramel in the fridge, it thickened up enough to drizzle over the top. 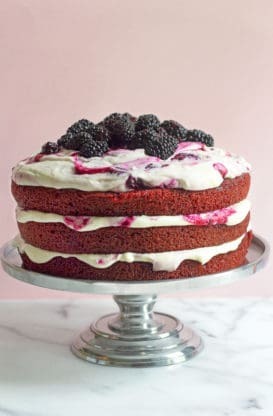 I said to myself I’m not going to all that trouble again for a cake, until I tasted it, its is sooooo delicious I only put 400g of sugar in the cake not 500g and it was perfect. Can’t wait to make it again and cook the caramel for 2 hours and get up to 240 degrees on my sugar thermometer. Such a perfectly moist cake! Oh, my! This is my dream dessert! I will love to try this divine looking cake ! what can I substitute sour cream with in this recipe ?as sour cm is not readily available in this part of my world. Do you have greek yogurt available? Hi there, This recipe looks amazing. 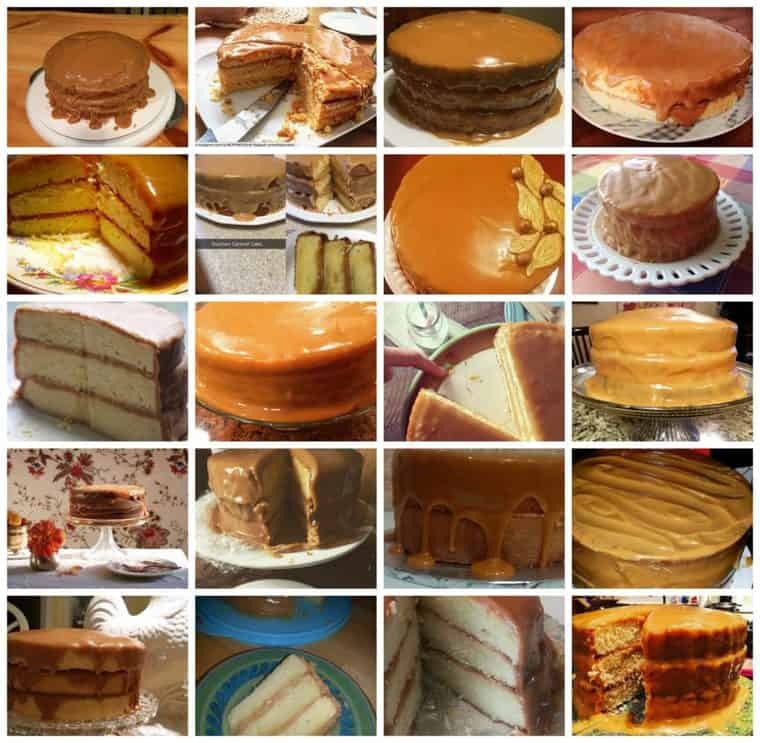 One of my closest friends is turning 60 and she told me her favorite cake is caramel cake. 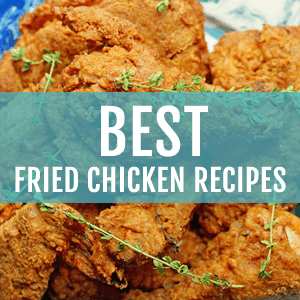 I’ve never made one, but found your amazing recipe so I’m going to make it for her. Any suggestions on how to transport this cake successfully in the car for 30 minutes? Hi Cindy, do you have a cake carrier? 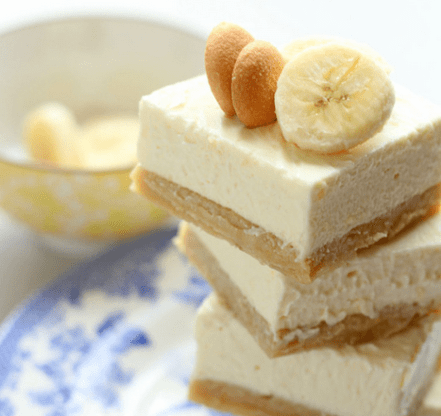 I have tons in my home and they are great for transporting desserts. I see a similar question to mine has been posted, but in case i don’t hear back from them on the results, I thought I would ask you if you are available! I will try to make this for an 80th bday party this weekend. I would like to use a half sheet rectangular wilton pan. 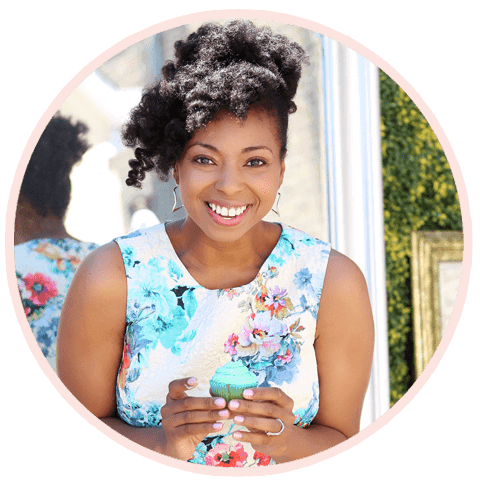 Have you known others to have success with this? Do you have any idea how much batter the recipe makes so I can approximate whether doubling it or tripling it will be necessary? 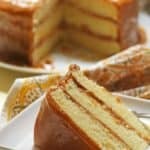 Finally, since it may be hard to layer, would you recommend poking a few holes throughout the finished cake, for the caramel frosting to sink into? Finally should i attempt to triple the icing in one batch- or is that destined for disaster? Hi Sabrina, no I haven’t baked it in that pan but I did have a few people who have and it seemed to be ok. I would just make sure you watch it for baking time since we don’t know exactly how long it would bake. 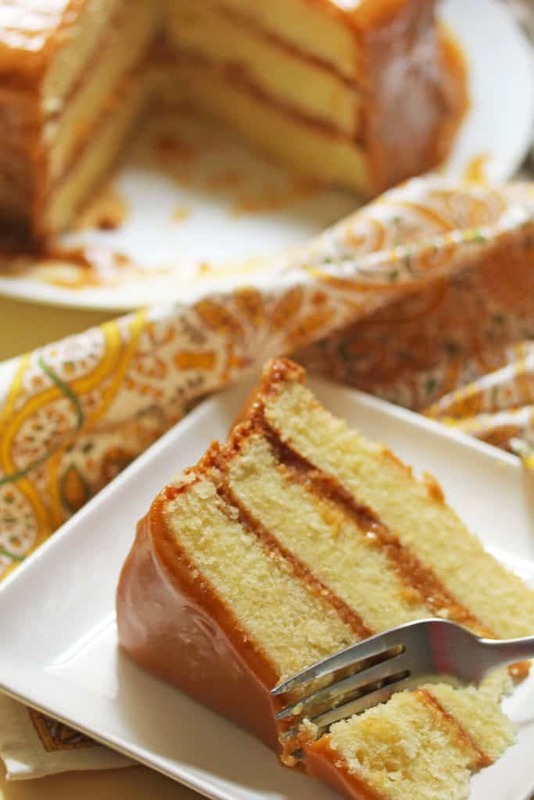 You definitely don’t need to poke the cake unless you keep the caramel loose and want it to seep in like a poke cake. However I would let it thicken as instructed and use it as an icing. Thanks so much Jocelyn! Trying the cake triple batched tonight! I’ll let you know how it goes! Turned out so great! Two versions. One according to recipe. 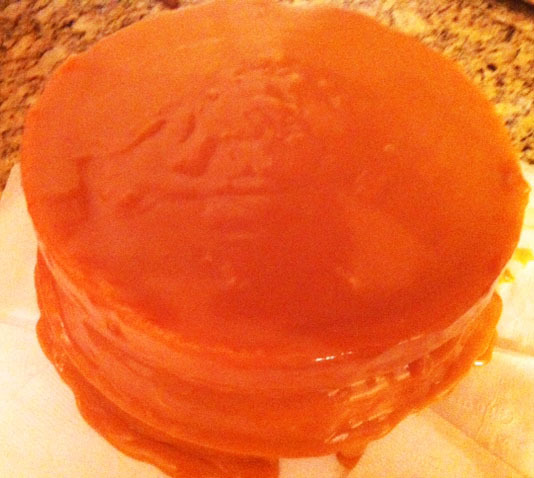 One included a middle layer of my first batch of caramel. Also I sprinkled some salt on the middle layer and the top I that one. My first batch i thought needed to go to cook two hours but was done long before. I stopped it at two hours and it was very dark and almost in a ball in the pan. I thinned it with heavy cream and almond milk and that did get it to a soft ball candy stage. Tasted great but would never pour. I thinned it enough to spread it as the icing between the layers. I froze the half sheet for a day before icing it. So moist. I tripled the batch of both icing and cake. Took about 2 hours and 15 minutes to get the caramel to the right color/stage. So pleased with the whole experience. Rave reviews! thanks for the recipe and the help! Hooray! I think it is definitely a recipe that you just get better and better at making the more you make it.